Russia’s Gazprom wants Ukraine’s Naftogaz to pay penalties for taking less than the agreed upon amount of gas in 2014, considering the so-called “take-or-pay” contract signed by the companies. Gazprom would require Naftogaz of Ukraine to pay $8.197 billion in “take-or-pay” contract penalties, said company head Aleksey Miller at the European Business Congress on Thursday. Russian natural gas producer also put Ukraine's total gas debt at almost $29.5 billion. At the end of 2014 Russia, Ukraine and the EU agreed to put a freeze on the “take-or-pay” principle for five months which means that in the period spanning 1 November 2014 to 31 March 2015, Russia would not impose fines on Ukraine. However, Gazprom has every right under the contract to fine Naftogaz for failing to provide payments from January 1 to October 31, 2014; there was no such freeze for the period of time spanning January 1 to October 31, 2014. Naftogaz has reacted by saying it has never paid penalties arising from the “take-or-pay” rule and does not intend to do it in the future. The Ukrainian company claims the “take or pay” condition is not part of the contract. At the same time the company welcomes the intention of Gazprom to submit their claims to an arbitration court. “Arbitration is the most civilized way to resolve commercial disputes when the parties cannot find a consensus through negotiations,” said the head of Naftogaz Andrei Kobolev, commenting on the statement of his Russian counterpart Aleksey Miller. “The corresponding claim will be addressed to Naftogaz of Ukraine today, the same claim will be directed to the Stockholm arbitration,” said Miller, quoted by RIA. Miller estimated the total debt of Naftogaz to Gazprom at more than $29 billion. He said $200 million are owed to Gazprom for gas deliveries to the Donetsk and the Lugansk regions in Eastern Ukraine. Earlier Gazprom filed an action to the Stockholm arbitration against Naftogaz, demanding $18.5 billion for the gas volumes in 2012-2013 that weren’t delivered by Gazprom but had to be paid for by Ukraine under the “take-or-pay” agreement. In April Miller proposed to extend the freezing of “take-or-pay” during a meeting with Russian President Vladimir Putin, who supported the idea, saying that Ukraine’s overcoming the crisis is in Russia’s interest. 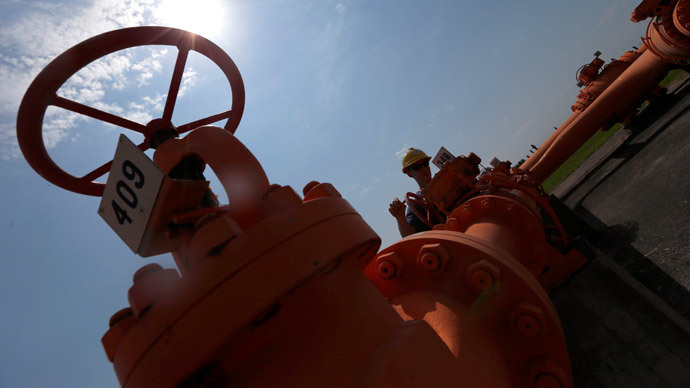 “We currently see that the level of Ukraine’s offtake of Russian gas is extremely low. This is connected with the decline in Ukrainian industry, with the increase in energy prices,” said Miller. The level of deliveries amounted to slightly more than 14 billion cubic meters of gas in 2014, while they agreed to take 41.6 billion under “take-or-pay,” he added. “Of course the difference is very large, and we believe it’s possible to support the appeal of our Ukrainian colleagues to extend the freeze on the ‘take-or-pay’ principle,” said Miller. Ukraine has been reducing the purchases of Russian gas since 2011. In 2011, Naftogaz bought 40 billion cubic meters, in 2013 the volume decreased to 25.8 billion cubic meters of gas and in 2014 it made only 15.3 billion cubic meters.